An OST? I wanna hear this! I’m really curious how they made Mozart’s pieces into rock style. Haha. <Mozart!>, which is being hailed as one of the best productions of the first half of 2010 that has captivated musical lovers, is set to be released through OST. <Mozart!> was the center of attention from the start as the Vienna, Austrian musical that infused classical and rock music was to be performed in Korea for the first time. The music was created by the hands of world renown lyricist Michael Kunze and Grammy Award winning composer Sylvester Levay. <Mozart!>, which began showing on the 20th, garnered the attention of fans by bringing top notch musical actors such as Lim Tae Gyung, Park Gun Hyung, Park Eun Tae, Min Young Gi, Yoon Hyung Ryeol, Seo Bun Seok, Bae Hae Sun and Jung Sun Ah together on one stage. Also, as news spread that TVXQ’s Xiah Junsu was cast as the lead role of Mozart and would be debuting as a musical actor, ticket reservation sites crashed and presented the musical with an explosive popularity. Xiah Junsu set the record for ‘All performances sold out’ and showed his enormous ticket power. In fact, the musical holds music of a great variation of colors ranging from an operatic aria to a majestic and overpowering orchestra piece, a powerful solo of the main character attempting to find his true self, a ballroom piece that portrays the jealousy and envy that pervades in Vienna, and a chorus that transitions from being bright and light to calm and sedated. The 28-man live orchestra’s deep choruses create a sturdy foundation for the plot and bring a richer atmosphere to the performance. After the performance, many said, “The ensemble and individual voices are extremely charming,” and “We want a Korean OST and DVD of the musical.” However, only the German version of the musical is available domestically and only slight previews of Park Eun Tae’s rehearsals give a glimpse into the Korean version of the songs. A representative of the production company Ttaeyaruteu said on the 29th that, “We are currently preparing a Mozart OST, and we are making slight changes in the actors’ schedules to do so,” and “It will take around two weeks till it is released.” This means that we may be able to get the Korean version of the OST before or after the Lunar New Year. On the other hand, <Mozart!>’s composer Sylvester Levay will be leaving Korea on the 30th. During his stay, he watched the performances at the Sejong Arts and Culture Center, and took pictures with his Korean fans. The musical <Mozart!> depicts Mozart’s longings for love and freedom through a blend of Rock’s passion, Pop’s sweetness and Jazz’s smoothness. It will be showing until February 21st in Seoul and then will be performing in Daegu, Changwon and Pusan. 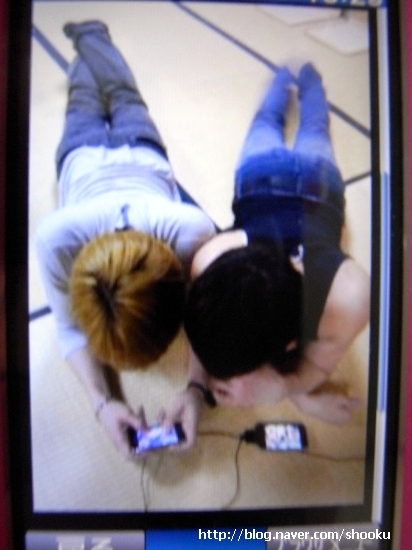 Having rest in the room with tatami floor, Jejung & Junsu! According to the magazine 「BACKSTAGE PASS March Issue」which was released on 27 January, a new song 「With All My Heart 〜君が踊る、夏〜」(T/N: With All My Heart~ You Dance, Summer~) has been recorded in CD2 of the 「2CD+DVD(A)「RZCD-46503〜4/B」version of Korean popular vocal group Tohoshinki’s best album 「BEST SELECTION 2010」. Besides the song 「With All My Heart 〜君が踊る、夏〜」in CD2, the members also selected the following songs: 「Forever Love（JUNSU）」「SHINE（YUCHUN）」「Love in the Ice（JEJUNG）」「Beautiful you （CHANGMIN）」「HUG（YUNHO）」and two more songs 「甘く果てしなく」(T/N: Eternally Sweet) and「BREAK OUT!」will be included, making it a total of 9 songs. The article below is similar to the one written on the 2nd paragraph of the article above but this one is only in list form for easier reading. T/N: The songs for CD2 is selected by the members, and were not revealed previously. Hmmm… I think the members’ selection were ok. I kinda expected “Love in the Ice” and “Hug” to be there but I wonder why no one chose “Proud”, “Begin” or “Purple Line” (especially since “Purple Line” is their very first single to make it to the top spot of Oricon Charts)? (Begin and Purple Line are already included in CD1. My bad. Hahaha) I never imagined “SHINE” will be chosen but I guess Yoochun is kinda unpredictable, right? Hahaha. The 29th single of Korean dance-vocal group Tohoshinki, “BREAK OUT!”, sold an approximately 170,000 copies on its first day, and ranked first on Oricon’s daily chart on 1/26. While being in the middle of break-up turmoils, this is a good start that is probably going earn them first place on Oricon weekly chart for the 7th time. The title song “BREAK OUT!”, which contains encouraging messages to young people who are trying their best, is the theme song for NHK’s drama “Tomehane! Suzuri Koukou Shodoubu”. The coupling song is Junsu’s solo “XIAHTIC”. Tohoshinki released their single “HUG” in November 2004 to mark their first time coming to Japan, and officially debuted in Japan in April 2005 with their single “Stay With Me Tonight”. They first entered the Oricon weekly chart with their 7th single “Sky” (on sale in August 2006), which ranked 6th of that week. They have constantly been on the top 10 of the chart since then. Starting from their 18th single “Purple Line” (on sale in January 2008), they’ve had 6 singles that rank first on Oricon weekly chart, and are currently holding the record for being the only foreign artist to acquire that achievement. They are planning to release their first best album “BEST SELECTION 2010″ on 2/17.